Oh my goodness. What can I say about this amazing farm wedding? Just that I loved it more than I knew I could love any wedding! Their fall farm wedding was such an amazingly beautiful DIY wedding. One of the reasons that their wedding was so special is that their friends and family pitched in to help them pull it all together. I met Carolanne when we were teaching together at an elementary school. She is the BEST art teacher!!!! Fast forward many many years and we are still in touch. Carolanne is the type of friend you don’t let go. Her smile and her upbeat personality are contagious and I’m lucky to have her as a friend. In Andy, she found a man who shares her love of art, music and children. The ceremony was so special. Carolanne and Andy wrote their own vows. Carolanne cried and it was the sweetest. 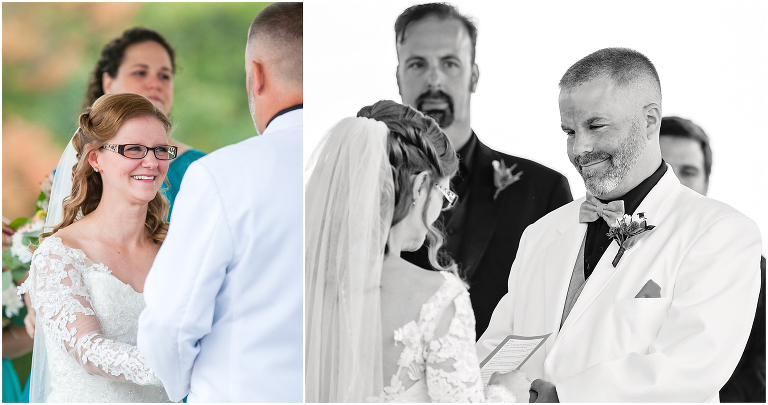 The way these two looked at each other during the ceremony melted my heart. Their children were part of the ceremony as well. Not only did they all have parts as members of the bridal party, they also created a family painting as part of their ceremony. And then the reception! In the sneak peek, I told you to be on the lookout for Carolanne dancing with her son. And I will not let you down. It’s here. I couldn’t even choose just one or two pictures! You know what else? If you want me to make your wedding my favorite of the season, just serve donuts! They cut a little cake (and smashed it a bit!) and then they served their guests donuts!!! So cool. And that cake topper? All I can do is laugh. Towards the end of the evening, Carolanne sang to Andy. She sang! Awwwww. Carolanne and Andy, thank you for trusting me with your wedding photography. I am honored that I got to be a part of your day. Your farm wedding was absolutely perfect. To be notified the next time they are featured, make sure to subscribe here. Please leave Carolanne and Andy some love and congratulations below in the comments section!